Scotland is a great place to visit for salmon, course, and sea fishing. Scotland has world famous salmon rivers like the Tweed, Tay, Spey and Dee, many of which have recently been reporting record catches. For the coarse angler, there is top quality pike fishing in beautiful locations, as well as carp, roach, perch and other fish. For the sea angler, Scotland offers a huge variety of species, from cod, bass and pollack to the huge skate found on the west coast. The River Don - Fantastic for not only salmon and sea trout, but also is one of the finest wild brown trout rivers in Europe. The River Don is a river in the northeast of the country; it rises in the Grampians and flows eastwards, through Aberdeenshire, to the North Sea at Aberdeen. Salmon enter the Don during most months of the year. May is the best time for the sea trout when they come off the tides giving good sport on the fly especially on the lower and lower middle river beats. Strathdon, 45 miles west of Aberdeen in the Highlands, attracts visitors for salmon and trout fishing as well as its castles and scenery. In the middle of May the first of the salmon arrive at Strathdon. The Semeil and Candacraig stretches of the river fish well giving good sport to brown trout fishermen. From late August into September, heavy runs of salmon and grilse move up to Strathdon although mainly colored fish, heading for the spawning beds. 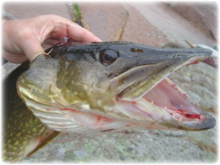 Pike are the most popular and widely distributed coarse species in Scotland. They are present throughout most of mainland Scotland, and good specimens are present in most waters. Pike can be found throughout Scotland from the rolling hills and rich agricultural land in Dumfries and Galloway, to the more populated areas in the Central belt all the way to the rugged and wind swept glory of the Highlands. Pike can adapt and survive within this multitude of waters, which means there are always going to be more waters available than anglers fishing. Certain areas of the better-known waters such as Loch Awe in Argyll and Loch Ken in Galloway have modest daily permits, which are widely available. These two waters along with Loch Lomond are the cornerstones of Scotland's Pike angling providing great sport for those who visit. The fish in these waters can be widely spread and can take some tracking down, but once found take baits freely. Try some sea fishing in a boat - just make sure the boat is properly licensed and the skipper is qualified. Here are some good spots on the Scottish coast to try your hand at sea fishing: From Berwick right up to St Andrews - expect to catch mainly cod with some ling, pollack, wrasse, coalfish and sea scorpion; Stonehaven - catches here include haddock, cod, ling, whiting, plaice, dabs, pounting and coalfish with some good sized fish on the wrecks; Scrabster on the north coast sees possibly the best fishing with cod, pollack and ling to double figures with coalfish, wrasse and dab also being plentiful, the winter months through to spring sees anglers targeting porbeagle shark which offer seriously big game prospects with fish estimated up to 500lbs; Oban and surrounding areas (west coast) - boats here make the most of the giant skate fishing - these can attain weights of over 200lbs and are tagged and released after capture. Scotland has an incomparable variety of geological features for a country of its size. 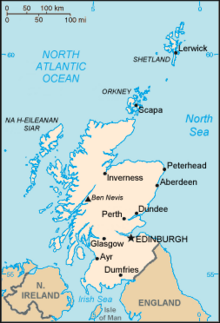 There are three main geographical sub-divisions: the Highlands and Islands is a diverse area which lies to the north and west of the Highland Boundary Fault; the Central Lowlands is a rift valley mainly comprising Paleozoic formations; and the Southern Uplands, which lie south of a second fault line and are largely composed of Silurian deposits. For a longer trip, many do inn to inn hiking where luggage is transferred separately. Some popular hiking trips of this nature include the Great Glen Way, the West Highland Way, and Hike along the Caledonian Canal. Some walk from east coast to west coast across the glens and highlands of Scotland from Inverness on the east coast to Mull on the west, and end up in Glasgow - estimated between 9 to 10 days. A Munro is a Scottish mountain with a height over 3,000 feet (914.4m). They are named after Sir Hugh Munro, who produced the first attempt at an exhaustive catalog of such hills, known as Munro's Tables, in 1891. Despite their modest height, walking and climbing in the Scottish mountains may be made treacherous by their latitude and exposure to Atlantic weather systems. Even in summer, conditions can be atrocious; thick fog, strong winds, driving rain and freezing summit temperatures are not unusual. 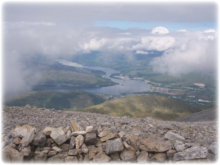 Probably the most famous Munro is Ben Nevis in the Lochaber area - highest peak in Scotland and the entire United Kingdom, with an altitude of 1,344m (4,410ft) above sea level. To walk up Ben Nevis, allow 7-10 hours and be prepared for all weather conditions. From Achintee is just under 13 miles, a 1,769m (5,803 ft) ascent. Follow the obvious Ben Nevis track as far as Lochan Meall. The track to Ben Nevis continues on a series of broad zigzags above but to reach Carn Mor Dearg continue past the loch around the flanks of Carn Dearg to drop down into the valley of the Allt a'Mhuilin. Cross the river near point GR154739 and climb east up rough bouldery slopes to Carn Beag Dearg. Continue south-south-east on ridge over Carn Dearg Meadhonach to Carn Mor Dearg. To continue to Ben Nevis follow the ridge south and cross the Carn Mor Dearg Arete. Where the Arete abuts on to the bulk of Ben Nevis, climb west over blocks and boulders to the summit. Take care in this area in conditions of snow cover: Many walkers have slipped from this point into Coire Leis below. 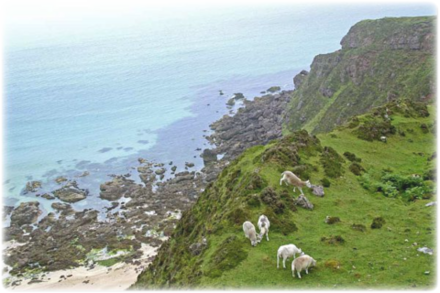 A route popular with experienced hillwalkers starts at Torlundy, a few miles northeast of Fort William on the A82 road, and follows the path alongside the Allt a' Mhuilinn. 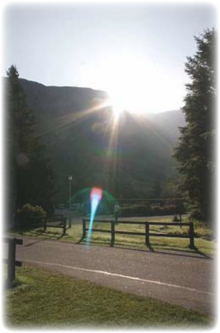 It can also be reached from Glen Nevis by following the Pony Track as far as Lochan Meall an t-Suidhe, then descending slightly to the CIC Hut. The route then ascends Carn Mor Dearg and continues along the Carn Mor Dearg Arete ("CMD Arete") before climbing steeply to the summit of Ben Nevis. This route involves a total of 1,500m of ascent and requires modest scrambling ability and a head for heights. In common with other approaches on this side of the mountain, it has the advantage of giving an extensive view of the cliffs of the north face, which are hidden from the Pony Track. For an unforgettable bike ride, head to the Outer Hebrides, which comprise an island chain off the west coast of Scotland. Lewis and Harris is the largest island in Scotland. Harris is the southern part, Lewis is in the north. Lewis is mostly open moorland, Harris is mountainous but very scenic, the east coast is rocky. The west coast is flatter, with vast sandy beaches. While Harris is hillier than Lewis it is more scenic and you should try to find time to cycle right round South Harris. For some interesting mountain biking, check out the Pentland Hills near Edinburgh. They can seem as remote and beautiful as any of Scotland's hills. They are now a Regional Park, mountain biking is allowed on marked routes and these are color coded. Yellow - suitable for cycling. Green - subject to erosion, no fierce braking. Red - risk of collision. You are not allowed to cycle on blue paths.